The COO of the Sony Entertainment Network, Shawn Layden, has revealed that its Music Unlimited service will be coming to iOS devices in the coming weeks. 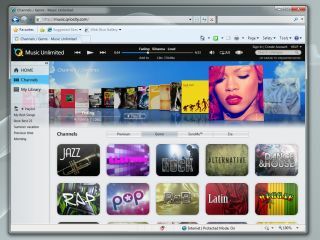 Sony's big push for 2012 is its new online network, which encompasses all of its web properties. Essentially the Sony Entertainment Network comprises the company's gaming, movies and music portfolios and Sony is hoping to bring these to as many devices as possible. At the moment, the Music Unlimited app is currently on Android and PS Vita, and now Layden has confirmed that it will shortly land on iOS. "We will be launching our music service on iOS in the next few weeks," said Layden, who was speaking at the IP&TV World Forum with TechRadar in attendance. "We want to be on as many devices for users who want to be part of Music Unlimited." When asked about Sony's relationship with Apple and in particular with iTunes, considering there will be some competition there when it launched its app, Layden said: "Sony music is still be part of iTunes – there is no change in that." He explained that the situation was similar to Sony letting other rivals use its service for their apps, and that it is all healthy competition. "There are many services Sony offers through PS3, tablet, Vita and Bravia TVs – it is a wide church. "We have video and music service but we also provide a base for Netflix and BBC iPlayer – we accept that people want what they want, and we are in a position to offer this."